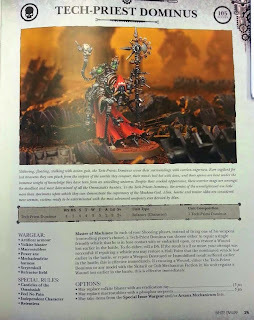 40K For the Win: Last of the Cult Mechanicus rumors. If you follow the major news sites you are sure to know that the last of the Cult Mechainus(CM) has been spoted and details are flooding everywhere. 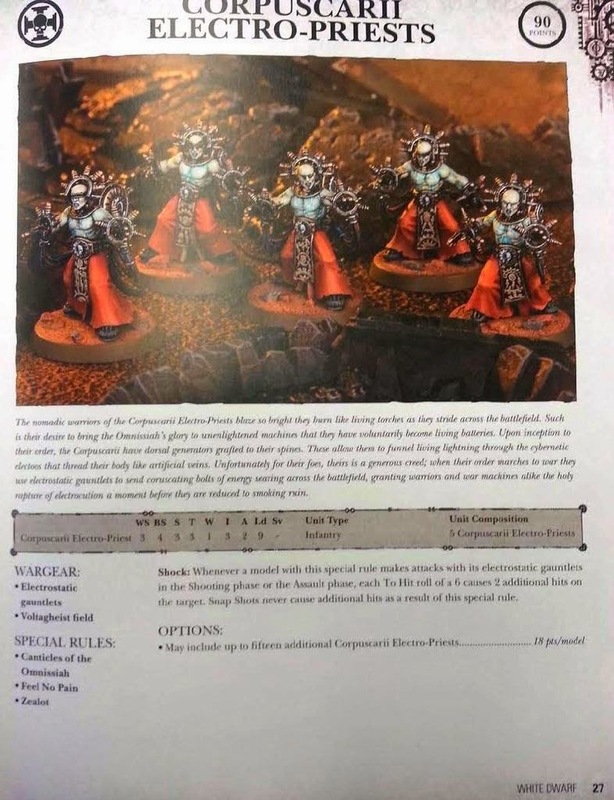 This week's white Dwarf will focus on the 2 types of priests (fulgurites and Corpuscariis), the HQ tech-priest dominus, and the White Dwarf Exclusive formation that combines Skitarii and CM and Imperial Knights. Before getting into the formation lets go over the units. These guys are melee only. They have a 5++ which turns into a 3++ if they wipe out a unit in combat. Their baton also makes them S5 AP4 in combat and they cause instant death on a role of 6. I see these guys being almost as useless as genestealers. They are slow have a bad save (until it kills something in combat. They are T3 so easy to pile on the wounds. I think that their only hope is that the enemy is to busy trying to kill the heavy hitters that these guys get ignored. 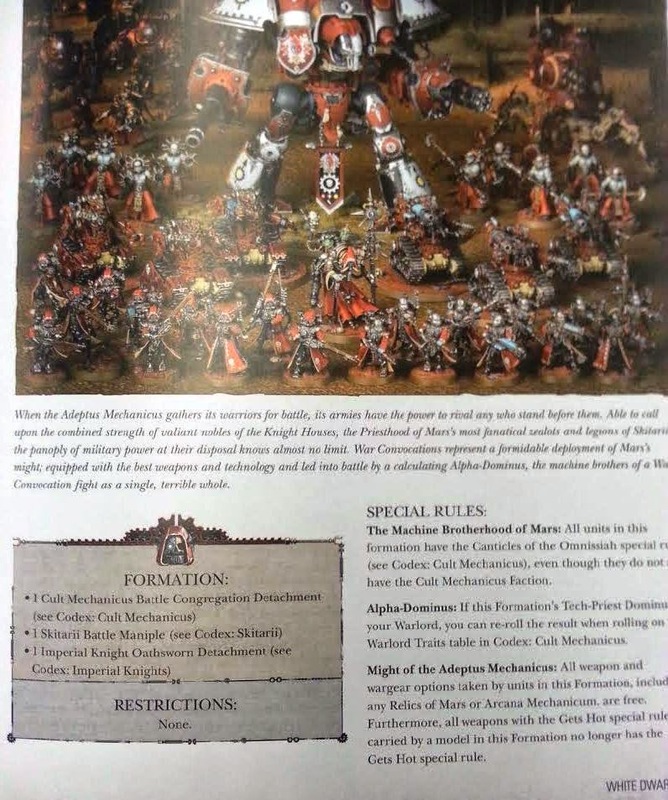 Maybe a big squad of 20 will make it into combat and if you are fighting hordes they can do some damage but against marines or worse terminators they will will be waves breaking against the shore. This is the other varinant of the eltro priest. They too have the 5++ but they don't get the buff like the fulgurites. The gauntlets do give them a shooting attack. 2 twin-linked shots at 12" is not bad but they are more of a slapfets than the Fulgurites with no ap what so ever. Everyone will get their saves. Hopefully they will be considered 2 weapons to give them an extra attack because they are going to need every attack they can get. This old man can have either the Volkite Blaster or a Eradication Beamer. There is a lot of love for the Volkite gun on bolter and chainsword but I don't see why. It is a mid ranged gun that, if it does a unsaved wound will do more wounds. With an AP of 5 I don't see it doing a lot of wounds. I would rather take the Beamer which gets AP1 up to 12" and AP3 out to 24" Besides that he has a 2+/5++ and T4 feel no pain. While not invincible he is a strong HQ that can heal hull points or wounds. Pretty handy. finally we come to the formation. In this foramtion you have to take the big take one of everything foramtionf from the Skitarii, the 1-3 knight fromation and one of the formations from the CM codex (not sure what the min is yet). it looks like this will be for bigger games since it is like 1000 for the skitarii and knight alone. 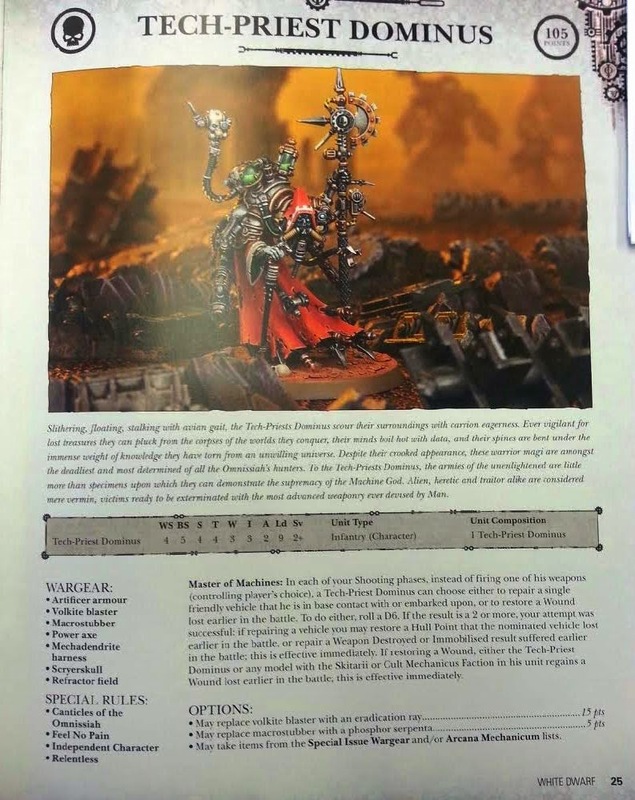 If you do take it though all upgrades are free, including relics, everything gets the Skitarii orders and the CM canticles, and "gets hot" is removed from units in the formation. This means you can load up on the plasma for free and not worry about hurting your own units. That is crazy! 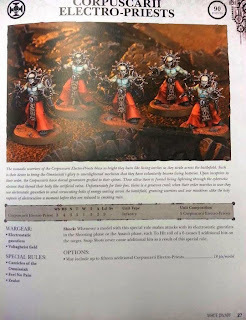 I will be forking over my money for this White Dwarf just so I can have access to this formation. To be honest though, I don't know if I would ever use it. First of all I would need all 3 Codecies. That right there is a problem. 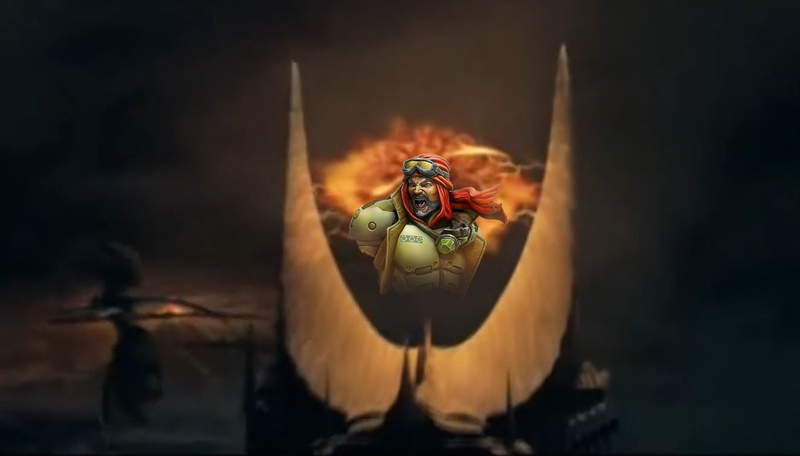 Next I would have to be in bigger games, another problem in my current meta. Unless the CM formation has the other formations in it I wouldn't get the ignores cover +1 BS formation I was drooling over eariler. Lastly I would eventually have to break down and get a knight. I just don't know if I can take 3 months of hobby money and get 1 model. Sure it is big and cool but do I want to be "that guy"? Again I don't have to hurry to make this decision since it won't be till next year till I play with them. 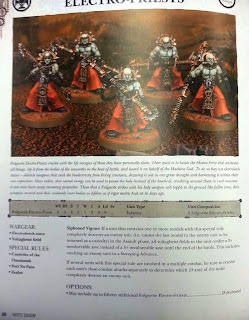 I am focusing on my Skitarii force first. 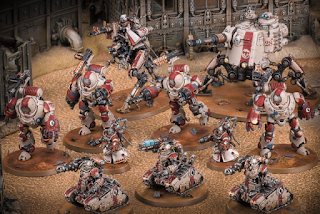 I want to fill out my troops get a unit of Infiltrators and the dunecrawlers first, then I can decide where to go from there. Whether it will be the Dragoons with snipers or ironstriders with lascannons or bring in some CM destroyers we shall see. That is 6-8 months away.